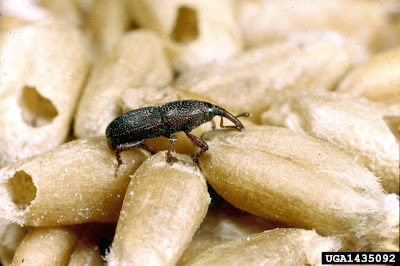 Granary weevil Sitophilus granarius, copyright Clemson University. The Dryophthoridae are a group of weevils that mostly attack monocotyledons such as grasses and palms, with some species boring in dead or rotten wood of gymnosperms and angiosperms. They are characterised by tarsi with the claws separated by overlapping dorsal and ventral expansions of the apical cuticle (Zimmerman 1993). Molecular phylogenetic analysis suggests that the Platypodinae may also be nested within this group (Gillett et al. 2014). [M86] Macleay, W. 1886. The insects of the Fly River, New Guinea, "Coleoptera" (continued). Proceedings of the Linnean Society of New South Wales, series 2, 1 (1): 183–204.